Partner and CERTIFIED FINANCIAL PLANNER™ Practitioner. Scott brings over 20 years of experience in the financial planning industry to IWM. 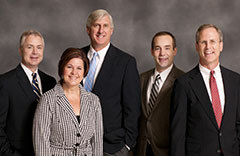 Prior to the formation of IWM, he established and operated Hackney Financial Services, LLC from 1998 to 2010. Former Continuing Education Instructor, Retirement Planning classes for Northwestern Michigan College in Traverse City, Central Michigan University in Saginaw and Mount Pleasant, Northwood University in Midland, and Mott Community College in Flint.